Spain is usually best known for its red wines over its whites, but you can find a few very good white wines that come from Spain. 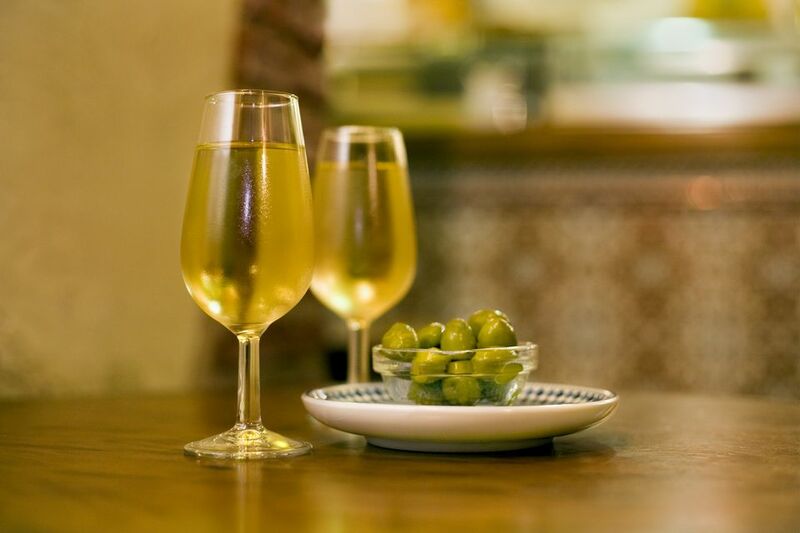 While on vacation in Spain, if you feel you need a break from red wine, feel comfortable ordering Ruedas, white Riojas, sherry, cava, Basque, and Galician whites. It can help to learn a little more about them. The most famous white wine in Spain is the Rueda, which is grown in the Castilla y Leon wine-growing region, in the cities of Valladolid, Segovia, and Avila. The word, Rueda, is Spanish for the word "wheel." The main grape used for a Rueda is the Verdejo. It is often blended with sauvignon blanc grapes. The wines have enjoyed great commercial success in part due to the clarification process that uses local clay. The first documented evidence of wine production in this area dates from the 11th century when King Alfonso VI offered land titles to settlers in the recently reconquered area. Many individuals and monastic orders accepted the offer and founded monasteries with their own vineyards. Spain's most famous wine region, La Rioja, is best known for its production of red wines, but it also makes some good white wine. White Rioja, also called Rioja Blanco, is made from Viura grapes (also known as Macabeo). It is normally blended with some malvasía and garnacha blanca. In the white wines, the Viura contributes mild fruitiness, acidity, and some aroma to the blend with garnacha blanca adding body and malvasía adding aroma. You can sample white Rioja where vineyards actually make it and take a Rioja wine tour. Though you didn't know Spain made good white wine, chances are you have already had some and you may even have some at home already, because sherry and cava are from Spain. Sherry is a fortified wine made in the city of Jerez in Andalusia. Jerez has been a center of viniculture since wine-making was introduced to Spain by the Phoenicians in 1100 B.C. The practice was carried on by the Romans when they took control of Iberia around 200 B.C. The Moors conquered the region in A.D. 711 and introduced distillation, which led to the development of brandy and fortified wine. The word "sherry" comes from the Arabic name for Jerez, pronounced "Sherish." Cava is Catalonia's answer to French champagne. Catalans will tell you that this sparkling white is every bit as good as champagne, even though it is sold at a fraction of the price. Other excellent white wines in Spain are the Basque txakoli, a once much maligned white wine that is moving upmarket in its production techniques and quality, as well as Ribeiro, a region of Galicia well known for its white wines. Spanish vineyards are not known for their ease of access and even when they are open to tourists, they usually concentrate on their red wines. If you like cava, you can find a guided tour, such as the Montserrat and Cava trail tour. Alternatively, if you are in Andalusia, you can try sherry in the bodegas in Jerez or on a tour of the region. For a mammoth tour of Spain and Portugal's wine regions, you can find wine tours of Spain and Portugal, where you can visit Rueda, Galicia, and northern Portugal, all of which are famous for their white wines. What is the Spanish Country Calling Code?